Tangyue Village, Anshun City, Guizhou Province was once a national second-class poor village with an annual per capita income of less than RMB 4,000. The village was poor, and the villagers were weak. People were scattered apart and the land was barren. 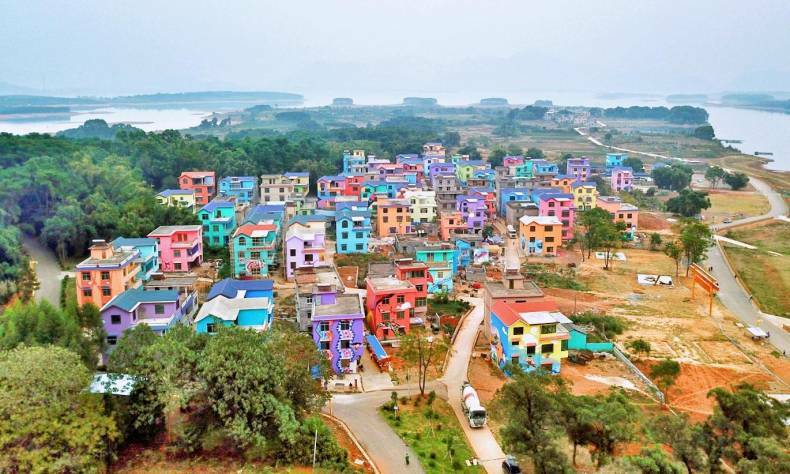 The idle land resources in Tangyue Village first began revitalization in 2014. With the development of a cooperative collective economy, the per capita net income of villagers rose from less than RMB 4,000 in 2013 to RMB 11,200 in 2017, and the scale of the collective economy of the village surged from less than RMB 40,000 to RMB 3.12 million. Nowadays, the whole village has risen from poverty in a comprehensive manner. The poor-to rich shift in Tangyue Village began with a flood, the scale of which hadn’t been seen in 100 years. There are 10 natural villages that are under the jurisdiction of Tangyue Village. In the preceding few years, young people often traveled to other cities to work, and some land in the village has been abandoned. The road to the farming areas had long been in disrepair, and was covered with grass. Only the elderly and children remained, turning the village into an empty shell. A flood swept Tangyue Village on June 3, 2014. As a result, the fields were flooded and roads were destroyed. With their hometown devastated by flood, the villagers were desperate. Survival and development became a problem faced by the entire village. As the village faced ruin, secretary of the Village Party Branch Zuo Wenxue quickly realized the most important thing was to reorganize the villagers to develop by relying on collective strength. On the sixth day after the flood receded, Zuo Wenxue convened meetings with people from 10 remote villages nearby. He proposed strengthening the collective economy and developing the economy through the leadership of collective cooperatives. To establish a cooperative is to plan centralized land in a unified manner, and build professional teams such as agricultural production teams, aquaculture teams, construction teams, transportation teams and processing teams to carry out corporatization efforts. The vital role of women must also be brought into play. Under such a scheme, both men and women are able work in various professional teams and receive monthly wages. The villagers’ shareholding rights to the cooperative’s land can be used to receive an asset-based bottom line income at an agreed price per year for each mu, and dividends can be paid at the end of the year. To join the cooperative is not an administrative order but a personal choice. Farmers can join and quit freely. The premise is that farmers’ contractual land management rights must be safeguarded, and the farmer voluntarily transfers contractual land management rights to the cooperative, that is, using the land to be shared in the cooperative. Zuo Wenxue’s proposal was approved by all participants, which he did not expect to happen. The Tangyue Village Cooperative was established in this way. Village Party Branch Secretary Zuo Wenxue holding a courtyard dam meeting, explaining the meaning of land rights. Land shareholding is based on the transfer of land rights, which is a difficult and meticulous job. This means to re-measure, register and archive the land contracted by the villagers, publicize the list and accept the supervision of all villagers. Finally, the government awarded the land contractual management right certificate, referred to as “land confirmation”. 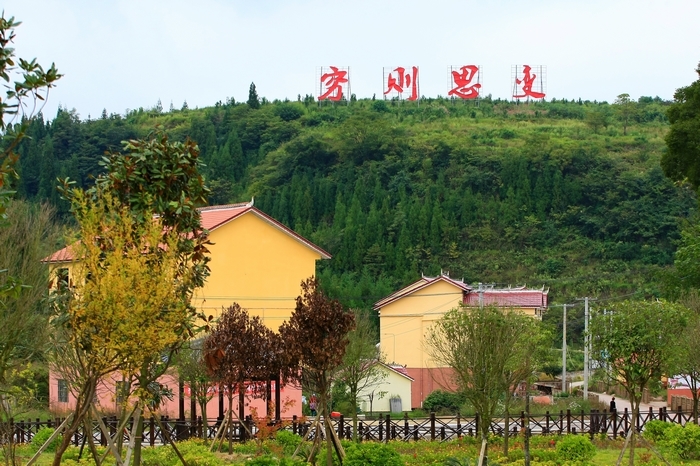 The land of Tangyue Village achieved “seven rights confirmed at the same time”. It contained accurate control of the contractual land management rights, forest rights, collective land ownership rights, collective construction land use rights, house ownership rights, small water conservancy project property rights and rural collective property rights. This marked a new approach to rural property rights reform. “This process involves the vital interests of each villager,” Zuo Wenxue explained. “We have convened a special villager congress to formulate an implementation plan. A leading group and a working group have been set up, and a three-level adjustment mechanism has been initiated. Any disputes in the process of determining the rights are first adjusted among the villagers, and the controversial ones are resubmitted to the mediation committee. Finally, those that remain undecided are submitted to the village congress for a vote.” Zuo added that every job in the village must reflect the high degree of autonomy that the villagers possess. In the process of confirming such powers, the village cadres must take the lead, followed by party members, then the village group leader and finally the villagers. With the village cadres and party members taking the lead in setting an example, the villagers will not concern themselves with the most minor profits and the work will be completed smoothly. Following that process, more than 4,200 mu of concentrated land began development for scale planting, and the proceeds were shared by cooperatives, village collectives and villagers by a 3:3:4 ratio. Thirty percent of the village’s land has been planted with a pollution-free vegetable base to serve the school cafeteria in the city. Women farmers in the area have become experts in modern agriculture. The villagers took shares in the land and began developing their businesses with the skills they already possessed. The farmers became shareholders. Village cooperatives provide greater employment opportunity for poor households. The villagers who work outside the home are attracted to return, and the elderly, women and children no longer stay behind on their own. The key to rural revitalization is talent. 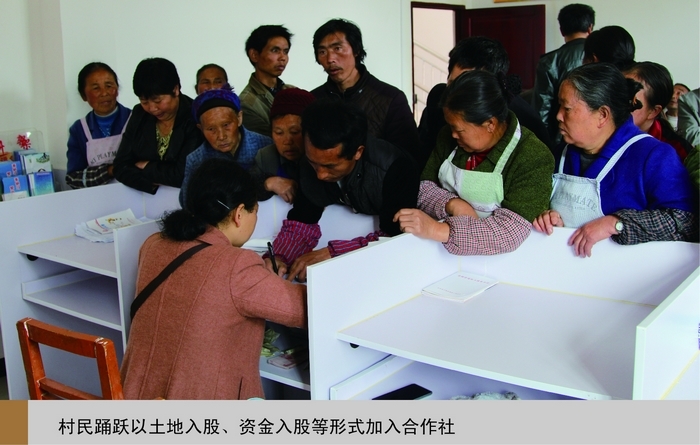 The highest level of education attained among the village cadres in Tangyue Village was a junior college degree. In the face of new problems that have been constantly emerging as China’s economy has developed, the existing talent pool in Tangyue Village was stretched. Therefore, Zuo Wenxue taught himself internet-plus development strategies, studied new business models and actively sought professional support from intellectuals. Experts from Tsinghua University, Peking University and Guizhou University soon became his village think tank. Zuo Wenxue also developed his own set of methods in helping the team develop further. He asked the village cadres not to sit in the office of the village committee, but to go to the masses to hear their problems, to truthfully record the opinions and problems of the villagers and sort out solutions to specific issues. “In the future, we need to build a cadre team that understands rural grassroots practices, understands national policies and can work hard to accomplish things,” Zuo said. Thus, Zuo Wenxue plans to use six years to rotate the village cadres, so that the young cadres will be more tempered and the personnel will be more local. 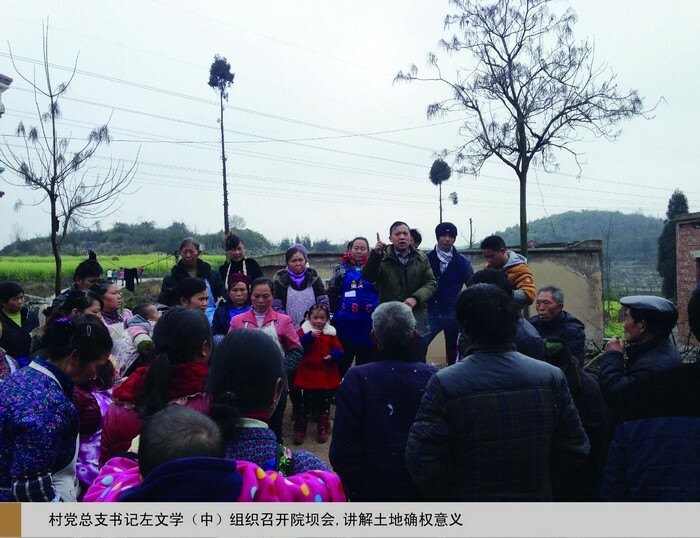 In order to convince the village cadres to stay and remain willing to work in the village, Zuo pledged: if you serve in the village for 20 years, the village collective will contribute a monthly pension of 1,500 yuan. The worries of the future are solved. Walking on the small road repaired in Tangyue Village, the villagers’ red second-floor buildings are scattered across the nearby mountains, and there are also modern reading facilities, Jingdong e-commerce service points, financial service centers and other modern rural service facilities in Tanguo Village. Zuo said that this was the most direct result of rural revitalization efforts. For the future of Tangyue Village, there is a blueprint in Zuo’s heart: the first step is to unite the land and take the path toward joint venture; the second step is to follow the modern rural industry road of vegetable sorting, clean vegetable packaging, central kitchens, cold chain distribution, electronic orders, product processing, solving labor employment and promoting village collective economic growth; the third step is to make full use of mountains, water, forests, fields, roads, villages and hot springs. Such superior resources enable the first, second and third industries to integrate deeply with big data, the internet, the Internet of Things and artificial intelligence to create an integrated rural economy and build a “smart Tangyue”.